Maryland right-hander Hunter Parsons earned Big Ten Co-Pitcher of the Week honors after a tossing a complete game shutout Sunday against Stetson. The junior needed just 101 pitches to go the distance, striking out nine Hatters and allowing just three baserunners – a pair of singles and a hit by pitch. His effort on the mound guided the Terps to a 2-0 victory in the rubber match of the home series against Stetson as they climbed back to .500 (12-12) on the season. 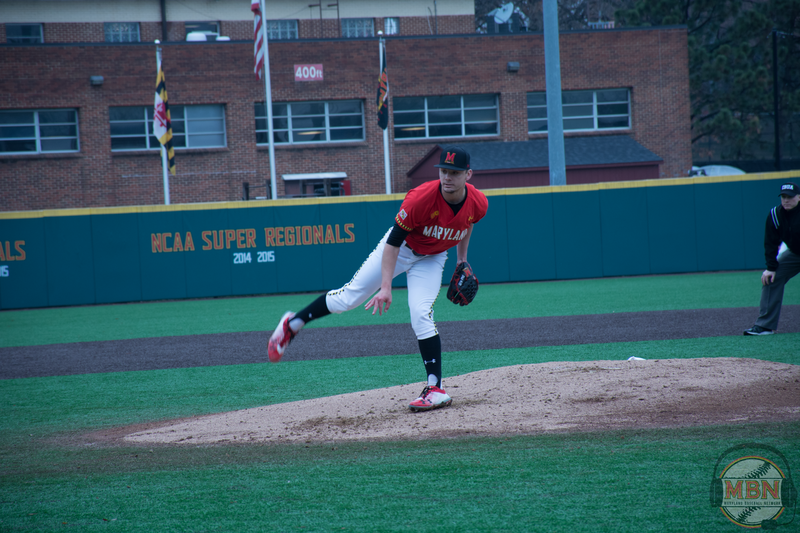 The Fruitland, Maryland, native is the second Terp named Pitcher of the Week this season, after senior right-hander Taylor Bloom earned the honor Feb. 19 for his seven-inning shutout performance in the season opener at Tennessee. Parsons shares the award this week with Iowa right-hander Brady Schanuel who tossed seven one-hit shutout innings in the Hawkeyes’ win over No. 11 Indiana. This is Parsons’ first Pitcher of the Week honor. He was named Big Ten Freshman of the Week in April 2016 after allowing two hits and one run in seven innings against James Madison. Sunday was the second complete game of the season for Parsons, who allowed three runs (two earned) in a nine-inning victory over Bryant March 11 in College Park. After a rough start to the season, Parsons has gone at least seven innings in four straight starts, pitching to a 0.84 ERA and 0.78 WHIP over that stretch while striking out 23 batters in 32 innings. He now leads Maryland starters with a 3.23 ERA and ranks second in innings pitched (39) behind Bloom.